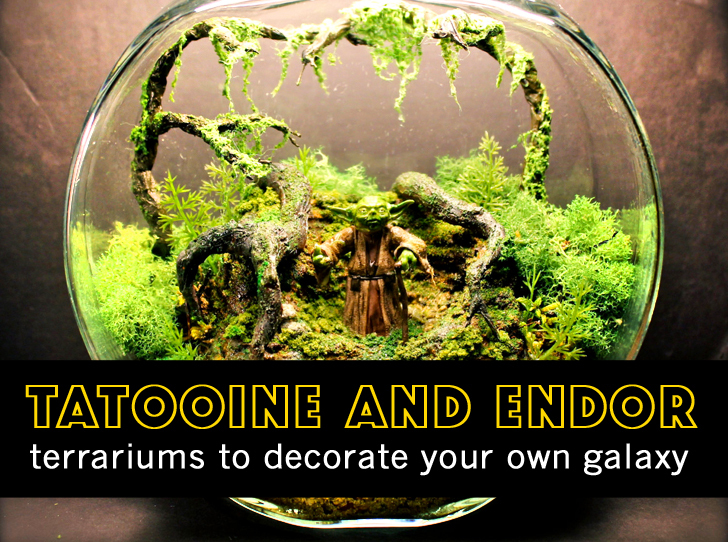 Miniature Star Wars Terrariums Bring Far Away Galaxies Into Your Home! In a workshop far, far away, artist Tony Larson recreates incredible Star Wars landscapes complete with our favorite iconic characters! Yoda, R2D2, and Ewoks strike action poses in glass enclosures filled with rocks, moss, and sand. George Lucas himself would be proud of the tiny globes, jars, and bowls from from Larson's "The Wonder Room". The tiny living sci-fi worlds are available through his Etsy Store, starting at around $100.00 for each realistic miniature scene. “Do or do not, there is no try,” Yoda instructs Luke in Star Wars. Larson doesn’t need to worry about trying to add a little extra wonder to an already fantastic idea. Larson’s Minnesota -based workshop, also known as “The Wonder Room,” succeeds in shrinking down entire planets with his collection of terrariums. In addition to the dinosaur zen gardens and Easter Island moai ruins, Larson also adds Star Wars action figures to his realistic habitats. R2D2 stands inside a 7″ globe among the rocky, gritty terrain on Tatooine on his mission to aid Princess Leah an even smaller Yoda rests in his 5″ mossy home in the Dagobah System and an Ewok proudly stares at you from his 8″ hexagonal housing at the base of hand-carved cliffs. These terrariums do not contain any live plants, so owners will not have to worry about watering while in the midst of an epic movie marathon. Star Wars fans may also enjoy exploring the rest of The Wonder Room with its dinosaur dioramas, ancient ruins, and Sasquatch habitats. All, of course, in glorious miniature. Favorite characters from the Star Wars films are captured beautifully in these miniature globes. "Do or do not, there is no try." Tony Larson does not need to worry about trying to add a little extra wonder to an already fantastic idea. Larson's Minnesota -based workshop, also known as "The Wonder Room" succeeds in shrinking down entire planets with his collection of terrariums. An even smaller Yoda rests in his 5' mossy home in the Dagobah System. R2D2 stands inside a 7' globe among the rocky, gritty terrain on Tatooine on his mission to aid Princess Leah. 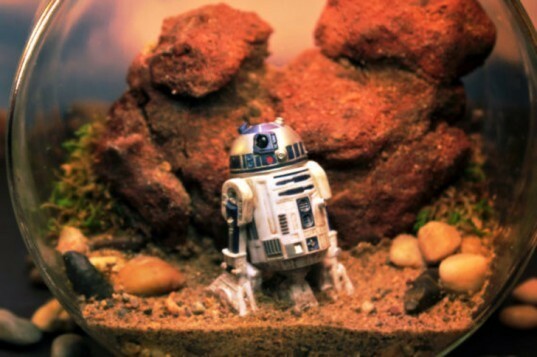 This tiny vintage R2D2 figure is a part of Larson's amazing series of Star Wars terrariums. An Ewok proudly stares at you from his 8' hexagonal housing at the base of hand-carved cliffs. These terrariums do not contain any live plants, to owners will not have to worry about watering while in the midst of a movie marathon.